Ever since my sister and I were little we always asked for these beans as “favorite beans” because as you have probably already figured out, they are our favorite beans. It’s a great side dish to grilled chicken, grilled pork, burgers, or BBQ and is an easy, cheap way to feed a family or small crowd. The best thing about these beans is you can change up the bean ingredients each time and they are still delicious! 3. Slice bacon into bite size pieces and throw bacon in at this time. Cook for about 5-7 minutes minutes before throwing in your chopped garlic. Cook another 5 minutes or so. Be careful not to burn the garlic and add olive oil as needed throughout saute process to keep moist. 4. Once bacon has been cooked and onion is fully caramelized, add three cans of beans to the mixture (do not drain beforehand). 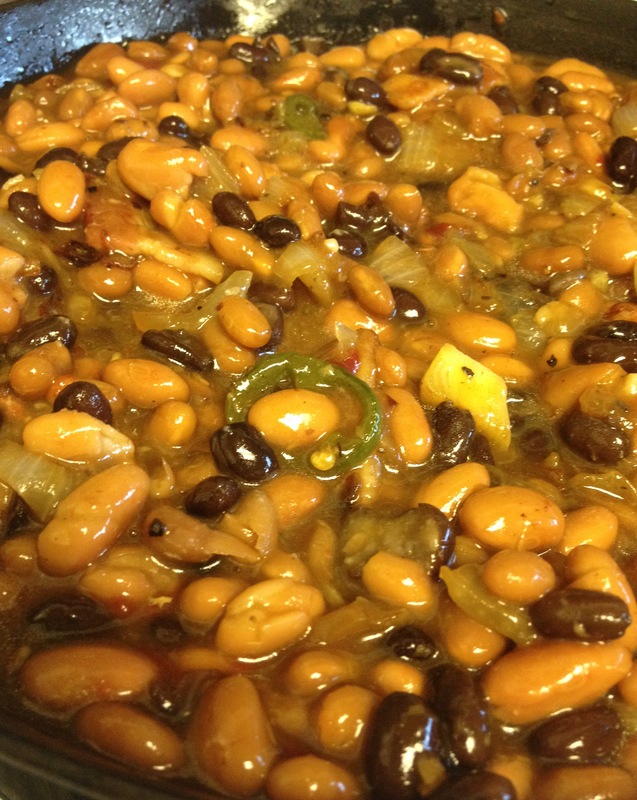 Turn heat down to low and allow beans to mingle with the yummy onion/jalapeno concoction for a few minutes while stirring to help them along. Give it a taste and see what you think. If you like your beans a little sweeter give them a healthy squirt of your favorite BBQ sauce. Personally, I like to add a squirt of Sweet Baby Ray’s Original BBQ sauce in there to take this dish over the top.